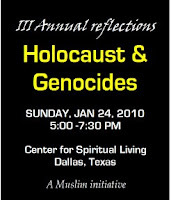 DALLAS – (January 14, 2010) –The Foundation for Pluralism announces the 7/7 speakers Panel to reflect upon the Holocaust and Genocides event at 5:00 PM on Sunday, January 24, 2010 at the Center for Spiritual Center, 4801 Spring Valley Road, Dallas, TX. 75244. Each individual in the seven member panel would acknowledge the inhumanity in each one of us and reflect upon the solutions for co-existence. It is a purposeful event to learn, acknowledge and reflect upon the terrible things, that we humans have inflicted upon each other. What can you do as individual? Dr. Jeffress, this is one of the most timely pieces, that we the people of faith need to read. I thank you from the bottom of my heart. It is time to get out and help, God is testing us and our intentions. Indeed, when we don't understand the calamities and its purpose, and we never will, it is good to trust in God. He is the creator and he knows his creation. It is the spirit of service, every religion is participating in the efforts to find relief to the victims in Haiti. This is what religion is all about; it is not me, me, and me, it is we, we and us. Religious parties in the Muslim world are hardly the juggernauts they've been made out to be. Do Muslims automatically vote Islamic? That's the concern conjured up by strongmen from Tunis to Tashkent, and plenty of Western experts agree. They point to the political victories of Islamic parties in Egypt, Palestine, and Turkey in recent years and warn that more elections across the Islamic world could turn power over to anti-democratic fundamentalists. But these victories turn out to be exceptions, not the political rule. When we examined results from parliamentary elections in all Muslim societies, we found a very different pattern: Given the choice, voters tend to go with secular parties, not religious ones. Over the past 40 years, 86 parliamentary elections in 20 countries have included one or more Islamic parties, according to annual reports from the Inter-Parliamentary Union. Voters in these places have overwhelmingly turned up their noses at such parties. Eighty percent of these Islamic parties earned less than 20 percent of the vote, and a majority got less than 10 percent -- hardly landslide victories. The same is true even over the last few years, with numbers barely changing since 2001. True, Islamic parties have won a few well-publicized breakthrough victories, such as in Algeria in 1991 and Palestine in 2006. But far more often, Islamic parties tend to do very poorly. What's more, the more free and fair an election is, the worse the Islamic parties do. By our calculations, the average percentage of seats won by Islamic parties in relatively free elections is 10 points lower than in less free ones. Even if they don't win, Islamic parties often find themselves liberalized by the electoral process. We found that Islamic party platforms are less likely to focus on sharia law or armed jihad in freer elections and more likely to uphold democracy and women's rights. And even in more authoritarian countries, Islamic party platforms have shifted over the course of multiple elections toward more liberal positions: Morocco's Justice and Development Party and Jordan's Islamic Action Front both stripped sharia law from their platforms over the last several years. These are still culturally conservative parties, by any standard, but their decision to run for office places them at odds with Islamic revolutionaries. In many cases, they're actually risking their lives. Almost two decades ago, even before his alliance with Osama bin Laden, Egyptian jihadist Ayman al-Zawahiri wrote a tract condemning the Muslim Brotherhood's abandonment of revolutionary methods in favor of electoral politics. "Whoever labels himself as a Muslim democrat, or a Muslim who calls for democracy, is like saying he is a Jewish Muslim or a Christian Muslim," he wrote. In Iraq, Sunni Islamic revolutionaries recently renewed their campaign "to start killing all those participating in the political process," according to a warning received by a Sunni politician who was subsequently assassinated in Mosul. What enrages Zawahiri and his ilk is that Islamists keep ignoring demands to stay out of parliamentary politics. Despite threats from terrorists and a cold shoulder from voters, more and more Islamic parties are entering the electoral process. A quarter-century ago, many of these movements were trying to overthrow the state and create an Islamic society, inspired by the Iranian Revolution. Now, disillusioned with revolution, they are working within the secular system. But today's problems for Islamic parties may recall an earlier historical moment, the watershed period of the early 20th century when demands for democracy and human rights first gained mass support in Muslim societies from the Russian Empire to the Ottoman Empire. Then as now, violent Islamic movements such as the Ottoman-era Islamic Unity Society objected to electoral politics. But that was not what ultimately undermined democracy in Muslim societies. Instead, secular autocrats, such as Mustafa Kemal Ataturk in Turkey and Reza Shah in Iran, suppressed pro-democratic Islamic movements, driving Islamists underground and helping to radicalize them. Today, too, dictators and terrorists are conspiring to keep Islamic political parties from competing freely for votes. Government repression has been successful in one sense -- Islamic parties have won few elections. In a broader sense, however, it is failing: According to the World Values Survey, which has polled cultural attitudes around the world, support for sharia is one-third lower in countries with relatively free elections than in other Muslim societies. In other words, suppressing Islamic movements has only made them more popular. Perhaps democratization is not such a gift to Islamists after all. Charles Kurzman is professor of sociology and Ijlal Naqvi is a sociology graduate student at the University of North Carolina at Chapel Hill. We appeal the Malaysian Government to reign in this immediately. BANGKOK — A ninth church was vandalized Monday in Malaysia in a series of arson attacks that have raised religious tensions surrounding a dispute over the use of the word “Allah” by Christians in this mostly Muslim nation. “Allah” is the common term for God in Malay-language Bibles, but the government and many Muslim groups insist that the word should be reserved for use in Islam. The attacks, which began on Friday, came after a court ruling on Dec. 31 that overturned a government ban on the use of “Allah” by Christians. That ruling has been stayed while the government appeals. Only one of the churches has been seriously damaged, and some of the attacks were minor. In Monday’s attack, the Sidang Injil Borneo Church in the central state of Negeri Sembilan was slightly damaged when its door was burned, according to local reports. Government officials condemned the violence Monday but defended their position, saying conditions are different in Malaysia from those in neighboring Indonesia or in Arab nations where “Allah” is the common term for God. “These outrageous incidents are acts of extremism and designed to weaken our diverse communities’ shared commitment to strengthen racial unity,” The Home Ministry secretary, Gen. Mahmood Adam, told reporters after briefing foreign diplomats on the situation. The violence has strained relations among Malays, who are mostly Muslim and who make up 60 percent of the population, and the Chinese and Indian minorities, who are Christian, Hindu and Buddhist. Indonesia is less divided, with Muslims making up 90 percent of its population of 240 million. Some Muslims in Malaysia say they fear that Christians are trying to win converts by using the word “Allah.” They say Muslim believers could be confused by the use. Business leaders have voiced concern that further attacks could threaten trade and investment. The tourism minister, Ng Yen Yen, said foreign visitors could be frightened away, although the ministry had not received any information on the effects so far. In a sign of the country’s racial and religious complexity, a leading Hindu organization said it would hold a candlelight vigil at a church in solidarity with the Christian minority. Church officials urged their parishioners not to participate in the vigil. “It sends the wrong message as if the non-Muslims are going against the Muslims,” Father Phillips Muthu of Assumption Church told Malaysiakini.com, an independent online news service. I applaud the decision by the Bombay High Court, they have set a new international precedent favoring the freedom of speech and adding the "Hate clause" to the ruling. This is something the Europeans can look up to. Freedom of speech must prevail. It is our duty to keep law and order and faithfully guard the safety of every citizen. Hate is one of the many sources of disrupting peace in a society and it is our responsibility to track down the source of such hate and work on mitigating it. We have an obligation to maintain a balance in the society. The story of the year is the great religious story of our time: the struggle of religions, particularly Islam, to choose an inclusive, tolerant attitude toward those outside the faith (and toward dissenters or those deemed heretics within). The alternative is an intolerance that will destroy us. The Swiss minaret controversy (where a referendum prohibited the construction of new minarets designed for Mosques) was a useful flashpoint. Here is critic Carlin Romano: "The day that Turkey apologizes and pays reparations for the Armenian genocide, that Saudi Arabia permits the building of churches and synagogues, that the Arab world thinks the homeland principles it applies to the Arabs of Palestine also apply to the Armenians of Turkey--on that day, I will find time to commiserate with the generally kind and hard-working Muslims of Switzerland." Romano's point is the imbalance in assumptions of tolerance. Europe was dragged, often kicking and screaming, into the pluralism that holds uneasy sway in the West. Yet Christianity did most of its struggling at the 'right' time - in Europe the battle for tolerance was fought in an age before weapons could kill millions at a stroke. Intolerance is ugly enough with a lance or longbow in hand. The fanatic's finger on a nuclear button is catastrophe. There are encouraging signs of growing moderation. After the Bali bombings Indonesia, the largest Muslim state, has grown more moderate, according to most observers. The recognition of extremism's frightening cost is growing. More prominent moderate voices are heard in the news. Still, the intolerance that edges into savagery is the great civilizational struggle of our day. There is no hiding from it or flinching from its consequences. It will not do to point out the undoubted truth that Christianity has its dangerous fundamentalists (Timothy McVeigh and his ilk) as does Judaism (some of the xenophobic extremists who are Baruch Goldstein's spiritual heirs) and Hinduism and indeed almost every faith on the planet. These individuals or groups are not the predominant population, nor those with power. In numbers, in sway, in the virulence and danger of the ideology, religiously motivated rejectionism and terror is today overwhelmingly a Muslim problem. None of the other issues: the paranoiac piffle about President Obama's being Muslim, the Pope's strange insensitivity to the legacy of the Holocaust, the role of religion in health care, not even the President's Cairo speech (which is a manifestation of the larger issue of addressing extremism) are more significant than this continuing life and death drama. Not even the overriding human rights issue of our time - the eradication of the sexual slave trade of women - ultimately takes precedence. In the liberation of women from subjugation however, there are the seeds of a greater liberality of thought and practice. Terrorism is not entirely separable from training in oppressively patriarchal systems. When religion abets suppression it betrays its own ideals and the image of God that is our most precious gift and legacy. The west has a great deal of work to do in reckoning with its own long history in the Muslim world. We have to take care with our rhetoric and assumptions. Yet clearly and inarguably, how Islam copes with its own extremism is the story of 2009, and will most likely prove the religious story of the age. Q: What was the most important religion story of 2009? The important story for me was the omni-absence of a personal God in so many stories about religion. God may not exactly be dead, but perhaps he, she, or it should be denied health insurance because of a strongly suspected pre-existing condition of nonexistence. The 2008 American Religious Identification Survey, released in March of 2009, showed that "Nones," those who don't belong to any particular religious group, is the fastest growing religious category in America. They are the only group to have grown in every state of the Union. Some are atheists, some are agnostics, some are spiritual, some believe in Karma or crystals, and some believe in a deity or deities. Most have simply rejected the religion in which they were raised. Generally, though, they are more accepting of those with different beliefs. Atheist and agnostic "Nones," emboldened by the release of the ARIS survey that showed unexpected growth of the non-religious, have become more vocal. And along with opportunities to increase the visibility of, and respect for, the viewpoints of secular Americans, there come the inevitable strategic and philosophical divisions. Here is my gross oversimplification of the two basic camps. Group A: Atheists who don't suffer fools gladly. They point out that religious belief should be treated as any other kind of belief, open to criticism, and that unquestioned faith is a vice with inherent dangers, not a virtue to be respected. Group B: Atheists who prefer identifying as humanists, who would rather look for ways to make this world a better place than talk about gods in which they don't believe. They try to find common bonds between theists and nontheists, and seek issues on which to cooperate. Their focus is on being good without God. Group A's take pride in being intellectually honest, while Group B's take pride in helping a movement grow. Quite a few, myself included, have a foot or toe in both groups. Many people distrust atheists because atheists don't worry about rewards or punishments in an afterlife. The message that needs to get out is how many non-atheists live like atheists, for all practical purposes, without belief in a judging god involved in the workings of the world. This would include all deists, almost all Unitarians, and most liberal religionists of all stripes. I even think many politicians, not just the one acknowledged atheist, Rep. Pete Stark (D-Cal), would be willing to make known publicly that their actions and policies have nothing to do with belief in an afterlife. I expect this category of "functional atheists," those who believe that their actions in this life have nothing to do with how or whether they are treated in an afterlife, is larger than just about any religious denomination. This brings me back to non-God religion stories, which I'll illustrate with two of this year's movies. The first is the blockbuster, Avatar. Russ Douthat, in the New York Times, wrote about its pantheism, a faith that equates God with Nature, where trees have "spiritual energy" and a network of energy is the sum total of every living thing. Douthat claims that Hollywood regularly returns to such themes because most people can't accept the literal-mindedness of monotheistic religions. It's a movie for my Group B people, since the good guys on this alien planet are spiritual progressives who prefer to be engaged in cooperating and making love, not war. For Group A people, a more interesting and less viewed movie is The Invention of Lying. It's about a culture even more alien, one in which nobody can lie. There is not even a word for "lie" or for "truth." You can guess what this does to politics, advertising, and dating. Then one person develops the ability to lie. In a world where every word is assumed to be the absolute truth, a liar can become a king or a god. With the best of intentions, our liar-hero (Mark) tries to comfort his dying mother by telling her that she will be going to a wonderful afterlife. Of course she and others believe him. Soon everyone in the world is begging for information about this afterlife. Every word Mark makes up is taken as, well, gospel. In the biggest lie of all, he tells the world there is a Man in the Sky who is responsible for everything, and they will be happy up there with him after death. When asked if the Man in the Sky is also responsible for cancer, Mark quickly has to grapple with theodicy, the question no monotheistic religion has been able to answer: Why is there evil in a world created by an all-powerful and benevolent god? Incidentally, I think the 10 rules for the world that Mark writes on Pizza Hut boxes compare favorably to the 10 Commandments. This movie helped me to imagine a world without lies. The movie's theme was that Man in the Sky religion is possible only in a world where it's possible to lie. (This reminds me that if there were an international anthem for atheists, it would be John Lennon's "Imagine"--no religion). Atheists sometimes compare belief in the biblical God to belief in Santa Claus. One difference is that Santa is omniscient only in December and omnipotent only on Christmas Eve. In "Do as I say, not as I do" fashion, many parents this month explained to their children why lying is bad, and that "Santa will know if you've been bad or good." Whatever parents teach their children about God or Santa, I hope it will include a message to be good for goodness' sake, a message to live by in all seasons. 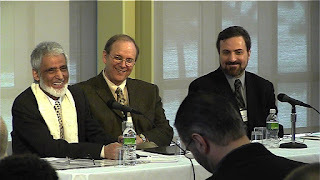 Baptists and Muslims:It began in January 2009 with a three-day meeting in Boston between 40 Baptist leaders and 40 Muslim leaders. Papers were presented. Prayers were said. Meals were shared. Business cards were exchanged. Promises for follow-up steps were made. Baptist-Muslim engagement may be the most unanticipated and underreported religion story of 2009 with the far-reaching potential to advance the common good. Time will soon determine whether it is a fool's errand or a fullness-of-time movement. Also in January, the Baptist World Alliance, the largest global Baptist body, released its official response to the Islamic letter known as "A Common Word Between Us and You." Two months later, the BWA dedicated a baptismal center on the Jordan River where John the Baptist is thought to have baptized Jesus. The land was a gift from the Jordanian government, facilitated by Prince Ghazi Bin Muhammad, who is the chief architect of the "Common Word" initiative. On the July 4th weekend in Washington, D.C., well-known Baptist preacher Rick Warren spoke at the annual meeting of the Islamic Society of North America. Off the public radar was another development. The Baptist Center for Ethics, better known for its Web site, EthicsDaily.com, was invited to produce an hour-long documentary that will begin airing on ABC-TV stations in January 2010. The documentary is titled "Different Books, Common Word: Baptists and Muslims." At the heart of the documentary is the recognition that Baptists and Muslims have different sacred books but a common word--love the neighbor. The documentary tells five stories about Muslims and Baptists who pursue neighbor love through interfaith dialogue and interfaith action, stories that will surprise viewers. These stories run counter to the dominant attitude among Baptist clergy toward Muslims. Too many Baptist preachers in America demonize the Prophet Muhammad and smear Muslims as terrorists, fearing Islam as a dangerous religion. Other fearful clerics avoid hate talk. Instead, they talk about the need to win Muslims to Jesus as the only way to relate to them. We take another approach. We believe the Bible calls us to love our neighbors, not as a means of conversion, but because it's the right thing to do. And the right thing for goodwill Baptists to do is to speak up for Muslims in our culture of anger and to reach out with a hand of partnership. Our documentary is about replacing the negative narratives with positive ones. We hope it will bring Baptists and Muslims together on the local level for conversations and community-building. If Muslims and Baptists are peacemakers together in the United States, then they will show the rest of the world a better way forward. The Malaysian Government may consider setting up a commission to figure out who owns Allah. From what I know, no one owns the word "Allah" nor does any one own "Allah". I can have one of the seven billionth (# of people) piece of God without asking permission from any one. And each part would be fulsome seven billion. You are welcome to steal my piece, I still would have it; owning one piece is like owning whole of the God. Same formula applies to the other names of God be it Yahweh, Krishna, Allah, Ahura Mazda, Wahe Guru, God or any other name one can imagine to call on the creator. God probably would be embarrassed if he figures out that we believe him to have limited linguistic comprehension, and that he only understands Hebrew, Sanskrit, Pali, Avesta, Aramaic, Latin or Arabic. Quite! Let him know not. Perhaps, one single event led to the other and the whole cosmos came into being. Whether it is evolution, creation or big bang, the fact of the matter is we exist. Thus the concept of oneness of creation, oneness of the humanity and oneness of the people translates into Oneness of God, One all loving God. Our Atheist friends don't have to call that thing God, just call it the causer of evolution, creation or the big bang; or don't call any thing, he has no problems with it and I know I don't. I hope you find the answer in various ways of praising your version of the lord; your lord, my version and every one's lord; the same causer and sustainer of the creation. Whatever way works for you is good, why should it matter how you worship? Your devotion to the creator is your own, it won't interfere with my life and it should not worry us a bit. God has not signed a secret deal with you to tell me that your way is the right way, you quote the Qur'aan, I will quote the Vedas, Bible, Torah, Avesta and other books or my native friend may quote his/her traditions. None of us is wrong, each one has his or her own version and all versions produce the same result; acknowledging something higher, immortal than us and that we have be humble, and humility eats up arrogance and brings conflictlessness among the people. That is what the kingdom of heaven is all about or may be more per you, and that is fine with me. The phrases like No God, One God, Many Gods, One family or Vasudeva Kutumbukum is all about peaceful co-existence of diverse people as one family. If we can learn to accept and respect the God given uniqueness of each one of the 7 billion of us, then conflicts fade and solutions emerge. Since I am a human like you and happen to believe in one of the 250 versions of God, let me share my version of that creator with you and I invite you to share your version right here in the comments section. Remember we create God in our own image, so there are at least 7 billion versions of the same God, and he (she or it) loves every which way we bow to him, acknowledge it and respect her. My version is Islamic, still the same God. The symbols in this article are the name of God, "Allah" in Arabic, as a Muslim I won't lock the unlockable God in words or in picture; it is not a being and is certainly not containable. No one's version is complete to the other, but given our limitations we create him in our own image, a deeper image en-carved in our imagination that is inexplicable and invisible like the pain in the neck. The most important aspect of quoting both the first and last chapters of Qur'aan has a purpose in it. Both verses do not address Muslims exclusively, in turn they address the whole cosmos and the human beings. Allah is addressing all of us in the book; he made sure that he did not address one people to exclude the other. He may have been motivated by the fear that some other God may take away the unclaimed people, so he was smart enough to include every one from the beginning to the end. I am sure he used the same strategy in all his books, be it the Vedas, Bible, Torah or any book or just through the oral traditions that our brothers and sisters in native and earth based traditions follow. God belongs to all, we don't need to own him (her or it), let him remain the creator and owner of our lives and let us call him whichever way we can. The Neocons Muslims (Equal and opposite counterparts of Neocons in all faiths) need to be happy that the Christians and Sikhs want to keep "Allah" as one of the names of God. Indeed, the Arab Christians also call the creator Allah. Perhaps it is the same word Ilahi Jesus used to use in Aramaic. Allah is God's name in Arabic. Allah, the creator and sustainer has no problems if we call him Yahweh, Ahura Mazda, Buddha, God, Ishwar, Mahavir, Wahe Guru or Allah. Let's not limit the capabilities of God to a language and a religion. He is the creator and sustainer of all worlds. As a Muslim I welcome every one to call God with his name in Arabic – "Allah" with equal devotion and honor. Quietly and peacefully this would be the response of over 99% of Muslims in the world. It is time for us to appeal the majority of Muslims in Malaysia to help those few lost brothers. The article below is a good summary of the evolution of Political Islam, and a good depiction of the transition, rather seamless transition from the Barelvi to the political Islam. We need to explore and wake up to the idea that Prophet Muhammad did not run the state of Madinah as an Islamic state. When he signed the documents as a head of the state, he removed the part of his signature that said he was the prophet of God and instead he affixed the traditional stamp, Muhammad son of Abdullah. Did he run Madinah as a Muslim or as a prophet of God? Even though he was a powerful man; he understood the denial of his prophethood by people of other faiths, and honored them by signing a few known documents for the sake of peaceful co-existence. Did he believe and value the idea of otherness of other, it is a great lesson for every one to think about it. He believed in the theology of non-complusion in faith and believed in acknowledging the differences with respect. It is a model for us to ponder over. Would you call that, a secular state or a pluralistic state? The fact that all faiths were given the right to practice their faith freely, it seems more like a Pluralistic state, the kind we have in India. We need to seriously do some research on this subject. We need to find a catalytic element to transform the monarchial and dictatorial run Muslim labeled states into the hands of the public. Where the public determines the best interests of the society and runs its own affairs, the narrow interest of a few is causing an imbalance, and moving away from peaceful societies with least conflicts. The role of a Muslim is to mitigate conflicts and nurture goodwill to bring about a just society. Roughly speaking, the political and social aspects of Islam in Pakistan can be seen as existing in and emerging from three distinct sets and clusters of thought. These clusters represent the three variations of political and social Islam that have evolved in this country: modern, popular and conservative. The modern aspect of Islamic thought in Pakistan has its roots in the 'Aligarh Movement' – a nineteenth century effort launched by Sir Syed Ahmed Khan. Ahmed strived to reinterpret the teachings of Islam so they could be brought in harmony with modern science and philosophy, helping the educated Muslims to continue holding on to their religion but through a rational and enlightened view of life. The Aligarh College, that later became a university, soon spawned what came to be known as the 'Aligarh generation' – groups of young educated Muslims who would go on to lay the initial foundations of the Pakistan Movement and also become the intellectual engines behind the movement's central ideological thrust. Though the Aligarh generation was trained in western law, politics and science, it also held dear Ahmad's notion that the Muslims of India were a separate cultural community; a thought that was molded into the Two Nation Theory by the All India Muslim League. Much has been contemplated about Jinnah's ideological orientation, but it is rather clear that the new country was founded on an understanding of Islam that was steeped in Ahmed's modern Islamic tradition. The Aligarh tradition that was carried into the corridors of the state and governance of Pakistan pointed towards the new country as being a modern Muslim majority republic, as opposed to a theocratic Islamic State. In fact, the Pakistani state and governments between 1947 and 1977 used (in varying degrees) the above rationale to keep at bay the religious parties' demand for a theocratic state. But it is also true that the modern Aligarh Muslim mindset was largely an urban phenomenon, associated with the urban middle-class elite of the Punjab and Karachi. The majority of Muslims in what became Pakistan remained ensconced in the region's popular variations of Islam. The so-called Barelvi Islam that became the mainstay belief of a majority of Muslims in the subcontinent (from the nineteenth century onwards), was, as a movement, the reassuring enshrinement of the traditional hybrid-Sufism that prevailed among the Muslims due to the long periods of interaction between Sufi Islam and Hinduism. This hybrid-Sufism, or Barlevi Islam, became the folk religion of the rural peasants, the urban proletariat and the semi-urban petty-bourgeoisie of the country. It incorporated the anti-clergy elements of Sufism, the jurisprudence doctrines of the more flexible Sunni Hanafi fiqh and, as had been the traditional practice of popular folk Islam of the region, fused these with the concept of overt religious reverence of divine concepts and people, and the accommodating forms of worship found in various shades of Hinduism. Though being populist and agrarian in its world view, Barlevi Islam did not negatively react to Ahmed's modern Islamic reform. What's more, it was the constant failure of the political exponents of puritanical Islamic thought to penetrate the thick veneer of Barlevi Islam surrounding the rural and urban masses of Pakistan that in turn facilitated the moderate Aligarh Muslim thought and tradition within the Pakistani state to continue deflecting theocratic maneuvers in the country's overall political polity. As various forms of Ahmed's modern and rational Islamic notions continued to dictate the Pakistani state's (albeit anti-pluralistic) politics, the masses-oriented make-up of Barlevi Islam became the chosen venue of populist politics in Pakistan. The left-leaning Pakistan Peoples Party (PPP) became the first Pakistani political party to set the tone of its manifesto and rhetoric according to the populist imagery of Barlevi Islam, in the process managing to attract the urban working classes and the rural peasantry towards its socialist program. Consequently, not only did the PPP chairman, Zulfikar Ali Bhutto, became one of the first major Pakistani political figures to start being seen indulging in rituals associated with Barlevi Islam (such as visiting Sufi shrines), PPP rallies themselves started radiating an aura of the colourful and musical activity found outside many Sufi shrines of the region (such as the dhamal). The 1970s in Pakistan thus became an era of populist extroversion. With Barlevi Islam adopted as a populist political expression by the ruling PPP. This saw a further hybridisation of Barlevi Islam. This form of expression eventually became the cultural and religious connect between the country's secular political parties, the working classes and the peasants. However, as the popular variation of Islam in Pakistan peaked in the 1970s, the modern variation (tied to the Aligarh thought) started to erode. Though the popular variation remained very much the focus of the populist Z A. Bhutto regime, things started to change at state level when after the 1971 East Pakistan debacle, a move was seen afoot in the army towards conservative (and elitist) variations of Islam, especially those advocated by renowned Islamic scholar and Jamaat-i-Islami (JI) chief, Abul Ala Maududi. The JI was an early advocate of what became to be known as Political Islam – a modern political theory that forwards the 'historical' and theological arguments for an evolutionary instatement of an Islamic state (or a modern-day caliphate) run on the dictates of the Shariah as an alternative to the capitalist-democratic system and socialism/communism. Political Islam first emerged as an opponent of secular/socialist Muslim nationalism in the 1950s and 1960s. After Egypt, Syria and Jordan's defeat at the hands of Israel in 1967, secular Muslim nationalism started to give way to Political Islam. Since the theological aspects of Political Islam were opposed to the more populist strains of the faith (such as Barlevi Islam), the JI in Pakistan was eventually successful in converting the urban middle-classes to its cause after these classes stopped resonating with the modern reformist variations of Islam in Pakistan. Thus, the urban bourgeoisie and the petty-bourgeoisie became the main players against the populist Bhutto regime during the 1976 PNA movement (led by the JI). But it wasn't until the arrival of the Ziaul Haq dictatorship and the anti-Soviet 'Afghan Jihad' that Political Islam managed to find state approval. Furthermore, as both the US and Saudi Arabia pumped in billions of dollars of aid so that Zia could construct an effective jihad against the Soviet Army in Afghanistan, the more aggressive and puritanical strains of Islam (such as the Deobandi and Wahahbi) too began finding official sanction. Conscious of the hold Barlevi Islam had in Pakistan, the Zia regime also attempted to penetrate and regulate Sindh and Punjab's shrine culture, trying to align Barlevi thought with the clergy and jihad-heavy strains of conservative Islam that he was advocating. The results were devastating. The corruption emerging from the large amounts of financial aid and state patronage Political Islam was able to enjoy in Pakistan during the Afghan jihad, steadily clipped away the intellectual aspects of the theory, and by 1989 (at the end of the Afghan war), Political Islam had become an empty shell in the hands of various Pakistani intelligence agencies who then filled this shell up with what would eventually surface as sheer fanaticism in the shape of sectarian organisations and phenomenon like the Taliban. This fanaticism is now not only the militant mainstay of anti-intellectual and fanatic Islamist organisations, but, as a rude social discourse, it is being attracting a large number of the urban middle-classes as well who now seem completely detached from their early moorings towards the modern variations of Islam, and as well as from the faith's more populist base. Political Islam suffered from its overindulgence in an unpopular and puritanical theological feast that came attached with the patronage it got from conservative Muslim monarchies and dictatorships. By the early 1990s, it was as good as dead due to the many failures it faced to transform Muslim countries into living Islamic states. However, it regenerated itself as a far more brutal, literalist and anti-intellectual fascist battle cry (in the shape of 'Islamism'), which has not only been able to find support among the most desperate sections of the Pakistani society, but, unfortunately, also in the seemingly intellectually bankrupt edifice of urban middle-class Pakistan. nadeem_80x80 Nadeem F. Paracha is a cultural critic and senior columnist for Dawn Newspaper and Dawn.com. India is ahead in technology, but its leaders aren't. The article is listed below. India has earned a reputation for information technology, however the leaders are a thousand years behind and frozen with the idea, that if you tell one thing in this room and the other in another room, no one would know it. How dumb! Mr. Chidambaram said beautiful things about Islam and its values a month ago at an Islamic seminary and then addressing the security personnel in another place, he said the opposite of it. Did he think Indians are dumb and stupid? Didn't he know the big row when former Prime Minister Mr. Vajpayee said two different things in BJP's Bangalore and Goa Conferences? Do they believe in the Las Vegas commercial that what you say or do remains here? The role of a leader is to work for peace in the country and not generate hate and malice between people that is breaking the law and order of the nation. Mr. Chidambaram says another dumb thing; that Jihad is terrorism that started in 1989 and Crusades were legitimate wars. Is this the kind of man India needs? I would hope the people of India demand their leaders to speak with one tongue and make statements that they don't have to retrieve. It is their ability to find the right information we have to look at. It is up to the people of India for him to continue making mistakes like this and create chaos. The link to a Muslim Scholar is in the Urdu Language, one of India's 14 official languages and he appeals to the leaders to study, or ask the religious leaders from different faiths before they make a statement about something they don't know. No need to pretend and pass out mis-information. New Delhi, Jan. 2: Muslim organisations have asked Union home minister P. Chidambaram to apologise or face legal action over his references to jihad in a lecture in Delhi last week. Delivering the Intelligence Bureau centenary endowment lecture on December 23, Chidambaram had said: "Just as the Cold War came to an end, we witnessed the emergence of another kind of war, namely, jihad. Jihad is a war or struggle against unbelievers and, currently, it is waged by a number of groups owing allegiance to Islam. Unlike the original Crusades, jihad is not fought like a conventional war. Jihad employs terror as an instrument to achieve its objectives. Such terror is directed against all and sundry, its victims are usually innocent people, and its goal is to overawe and overthrow the established authority. The tactics of the jihadis have been copied by militants belonging to other groups too, not excluding militants professing the Hindu faith." Organisations such as the All India Muslim Personal Law Board, Jamaat-e-Islami Hind and the Jamiat Ulema have condemned the statement. Qasim Rasool Ilyas, executive committee member of the All India Muslim Personal Law Board, described Chidambaram's statement as highly deplorable. "A couple of months back, he had praised Islam in high terms while addressing the gathering of Jamiat Ulema-i-Hind in Deoband and said that terrorism had been wrongly attached with Islam which preaches peace. But addressing police and intelligence officials, he has now equated jihad with terrorism. It is very unfortunate and uncalled-for from a person who is holding the very important post of home minister," Ilyas said. The Tamil Nadu Muslim Munnetra Kazhagam, a Muslim organisation from Chidambaram's home state, has threatened legal action if he does not withdraw his statement. Another organisation, the Tamil Nadu Shariath Protection Council, has given the minister a week to apologise. "Your statement has caused anguish and resentment affecting the good relations between the Muslim community and the party in power at the Centre. It is our hope that you will be gentlemanly enough to withdraw your statement," said the Muslim Munnetra Kazhagam president, M.H. Jawahirullah. "Your reported speech at the recent Intelligence Bureau meeting equating two diametrically opposite concepts, viz. the noble jihad with the abominable terrorism, has very badly hurt the sentiments of the Muslim minority community," Jawahirullah said. In an open letter to the minister, Jawahirullah said: "Jihad is admittedly a struggle but against what and against whom is the question. It is a striving against injustice and falsehood. That Islam teaches that this should be done through violence is an unadulterated lie. "Making a distinction between the 'Crusades' and 'jihad', it is reported that you have chosen to call the former a "conventional war" and the latter "a war against unbelievers". I am sorry to say, with all the emphasis at my command, that nothing is farther from the truth than the said statement of yours. The Crusades were regular, full-fledged wars between two states, viz two communities — Christians and Muslims — sponsored by the rulers of the respective groups, led by their respective military commanders. It is only if and when Muslims engage themselves in such a kind of war, it is taken to be a jihad. Even during such war, Muslims have been directed not to attack priests, the aged, women and children." Response by a Muslim Scholar in the language of Urdu. ZIAUDDIN SARDAR London-based author of Desperately Seeking Paradise, Balti Britain: A Provocative Journey through Asian Britain, and many other books. Last week, I took the Euro Star from St Pancras International station in London to Paris. Just after clearing immigration, I was stopped by a security officer. Nothing unusual in that, except I was the only one he stopped and questioned in literally thousands of passengers. I had some time to kill so I stood beside him to watch who else he interrogates . In 40 minutes, he only stopped two other people. The first was an old man clearly recognisable as a Muslim: beard, cap, badly-fitted suit, Arab (I guessed Tunisian) origins. The other was a person who strikes terror in the heart of every security officer: a Muslim woman in hijab. This is perhaps the most noticeable feature of the passing decade for us Muslims. We are now universally regarded as objects of suspicion and subjects for interrogation. The main reason behind this is the momentous atrocity that began the Noughties: the terrorist attacks in New York and Washington on September 11, 2001. It is hardly surprising that the last decade has been dominated by the consequences of that attack. Most of the negative as well as positive developments in the Muslim world during the last ten years can be traced to that fateful event. Terrorism, however, was not new to the Muslim world: it had been a problem before 9/11. In Pakistan , Kashmir, Egypt, and in Palestine, the cycle of sectarian and ideological terror and counter terror had already cost innumerable lives. In Chechnya, Bosnia and occupied Palestine, Muslims were victims of what can only be described as state-sponsored terrorism. And the vast majority of the victims of this internal and external violence were Muslims. But the 9/11 atrocity did create a new chapter. To begin with, it compounded a set of problems that existed for some time. For more than a generation , since at least the 'Islamic Revolution' in Iran, the political rhetoric in the Muslim world had been changing from the hyperbole of sabrerattling nationalism to macho militancy seeking to clothe itself in the legitimating mantle of Islam. The response to the 9/11 atrocity, the so-called 'war on terror' , took that tendency to a new height. The 'war on terror' had a devastating impact both on the external realities of Muslim societies as well as on Muslim consciousnesses. It changed not only the course of history in Iraq, Afghanistan and Pakistan but also served as a springboard for the revival of the Taliban and the emergence of new militant groups such as the Jemaah Islamiya in Indonesia and the radical Shabab in the Horn of Africa. It also laid the foundation for home-grown al-Qaida-inspired terrorism in Europe and America. The hatred of America in the Muslim world, a direct consequence of the 'war on terror' , also became an ideal substitute, in certain circles, for introspection and reflexive thought on the economic, social and political problems of many Muslim countries. There were other consequences as well. Western reactions to 'Muslim terror' in Iraq and Afghanistan reinforced the negative views of Islam and Muslims. The fear and loathing of Muslims has been an integral part of European consciousness almost from the inception of Islam. Bloody terrorist campaigns by fringe Muslim organisations brought these anti-Islam and anti-Muslim narratives, 'the darker side of Europe' , to the fore. What was conventionally described as 'Orientalism' , a refined literary and scholarly way of ascribing radicalism, backwardness and violence to Muslims, was transformed during the Noughties into what came to be known as 'Islamophobia' : crude, unabashed religious discrimination and racism against Muslims. Europe has seen a frightening rise in Islamophobia since the July 7, 2005 bombings in London . As 'Muslims in Europe: A Report on 11 EU Cities' , published last week by the Open Society Institute , shows, prejudice and discrimination are the routine, everyday experience of European Muslims in such cities as Antwerp, Berlin, Copenhagen , Paris and Stockholm. Riding on openly anti-Muslim tickets, far-right political parties have made considerable gains all over Europe - from Denmark to Italy, Belgium, Germany and Britain. Even the so-called moderate conservative parties now routinely employ anti-Muslim narratives that tell of an indigenous culture being 'swamped' by 'alien' and 'hostile' Muslims with their fundamentally incompatible attitudes to gender, sexuality and freedom of expression. The much-vaunted freedom of expression was itself curtailed throughout much of the Muslim world as a result of the 'war on terror' . The outcome was predicted by Anwar Ibrahim, one of the most lucid voices of sanity in the Muslim world, in early 2002. Ibrahim, one-time founder of an Islamic movement and former deputy prime minister of Malaysia, was a major threat to the corrupt regime of the then prime minister, the autocratic Mahathir Muhammad. Mahathir had Ibrahim framed on homosexuality charges, and after a sham trial, sentenced to fifteen years in prison. The development of the 'Anwar phenomenon' , as it came to be known, kept Muslim intellectuals throughout the world gripped for most of the decade. One consequence of the 9/11 atrocity, said Ibrahim in an open letter written from his prison cell, would be that "the nascent democratic movements in Muslim countries will regress for a few decades as ruling autocrats use their participation in the global war against terrorism to terrorise their critics and dissenters" . Indeed, this is exactly what happened in Egypt, Algeria, Jordan, Iran and many other Muslim countries. The problem for Muslim societies, Ibrahim explained , was simple: "In the centuries when Islam created civilizations, men of wealth created pious foundations supporting universities and hospitals. Princes competed with one another to patronize scientists, philosophers and men of letters." That was then, now: "bin Laden uses his personal fortune to sponsor terror and murder, not learning and creativity, and to wreak destruction rather than promote creation. Osama bin Laden and his protÃ©gÃ©s are the children of desperation; they come from countries where political struggle through peaceful means is futile. In many Muslim countries, political dissent is simply illegal." In many - but not in all. And this is where the dark clouds of the Noughties revealed their silver lining. While the centre of Islam - the Arab world, Iran, Pakistan - was embroiled in strife and turmoil, something very interesting was happening at the periphery. Muslim democratic movements in Indonesia and Turkey made substantial gains. A miracle was performed in Morocco: Islamic personal law was totally changed and transformed . In Malaysia, Anwar Ibrahim himself was released in September 2004; and went on to lead the opposition in April 2008 after an election that shattered the absolute dominance of UMNO, the corrupt ruling party of Malaysia. The 2002 election in Turkey brought the Justice and Development Party (AKP) into power. Led by Recep Tayyip Erdogen, former mayor of Istanbul, the AKP has deep Islamic roots. Both its leaders and the mass of its supporters are committed Muslims . Almost immediately, AKP demonstrated that it was more committed to democracy than any other political party in Turkey. The AKP used standard Islamic principles to realign Islamic politics towards democracy. Its leaders argued that politics in Islam has to be based on the Qur'anic concept of shura, or consultation, and therefore must be consensual and democratic. They introduced far-reaching reforms: death penalty was abolished, minorities were given more freedom , including the right to their own language education , and various aspects of human rights legislation were put on the statue books. The AKP even tried to change the law to ensure that the military cannot intervene in the political process. And, as its resounding success in 2007 proved, AKP turned out to be an effective and efficient manager of the economy; it has been credited with being economically the most successful party in Turkey's history. The AKP has proved that Islamic politics need not be the sole preserve of the fanatics and the Mullahs. It can be an effective instrument to establish civic society and a thriving democracy. Indonesia went through a similar transformation . The first direct presidential election in 2004 was a watershed for the largest republic in the Muslim world. Unlike Pakistan or Bangladesh, where the Islamic movements are marginalised and have never won more than three or four per cent of the votes, the Islamic movements in Indonesia are a mass phenomenon. Organisations like Muhammadiyah , Nahdlatul Ulama (NU) and Liberal Islam Network (LIN) have followers in scores of millions. Since the return of democracy in Indonesia, these organisations have argued that Islamic politics is not about establishing a utopian 'Islamic state' where 'the shariah is supreme' but about creating a civic society where accountability, transparency and participatory democracy are the norm. Moreover, the shariah's overemphasis on formality and symbolism has drained it of all ethical and humane dimensions; and as such, it needs to be totally reformulated. Both democracy and Islamic law must evolve from below with the participation of the masses. This is the message that the largely young members of Muhammadiyah and LIN have been promoting in mosques, schools and universities throughout Indonesia. This outlook was the cornerstone of the peaceful settlement in 2005 of the long-running armed conflict in Aceh. While the Islamic movement in Indonesia is still grappling with ways and means of reformulating the shariah, Morocco has provided a clear lead. The family law in Morocco, known as Moudawana, was based on the traditional Islamic rules on marriage, divorce, inheritance, polygamy and child custody. Women's groups and enlightened Muslim scholars had been campaigning for decades to change and reform it without much success. But 9/11 and its aftermath provided a new impetus. A special commission , which notably included women, was created with the specific task of producing fresh legislation based on the principles of Islam. The resulting family law, which was introduced on the statute books in February 2004, sweeps away centuries of bigotry and bias against women. The new Moudawana allows a woman to contract a marriage without the legal approval of a guardian. Verbal divorce has been outlawed: men now require prior authorisation from a court, and women have exactly the same rights. Women can claim alimony and can be granted custody of their children even if they remarry. Husbands and wives must share property acquired during the marriage. Men are no longer the 'leaders' of the family; both husband and wife share the leadership role. The old custom of favouring male heirs in the sharing of inherited land has also been dropped, making it possible for grandchildren on the daughter's side to inherit from their grandfather, just like grandchildren on the son's side. As for polygamy, it has been all but abolished. Men can take second wives only with the full consent of the first wife and only if they can prove, in a court of law, that they can treat them both with absolute justice - an impossible condition. Every change in the law is justified - chapter and verse - from the Qur'an , and from the examples and traditions of the Prophet Muhammad. And every change acquired the consent of the religious scholars. With the exception of the gripes of a few extremists , the new shariah has been widely welcomed, even by the Islamist political organisations. Justice and Development Party described the law as "a pioneering reform" that is "in line with the prescriptions of Islam and with the aims of our religion" . If the shariah can be changed then anything and everything in the Muslim world is amenable to change. Not least in India, where the efforts of the All India Muslim Personal Law Board to declare 'triple talaq' null and void suggest stirrings of a forward movement. But the narrow-minded conservatives , in India as elsewhere, move quasi-statically . For sure, fundamentalism will continue to be with us for some time. But it is totally vacuous, based on nothing more than hateful slogans and, as such, is bound to wither away. Adaptation and emulation of the successful aspects of the Islamic movements in Indonesia, Malaysia and Turkey will increasingly become the dominant theme. As in the past, so in the future: the centre of the Muslim world will be slowly but surely transformed from the periphery. Quote, "For sure, fundamentalism will continue to be with us for some time. But it is totally vacuous, based on nothing more than hateful slogans and, as such, is bound to wither away." Indeed, fundamentalism is part of the whole, every group and every tradition will continue to hang on to some fundamentals as a safety niche, and it will be a part of the social fabric. We have to figure out working the least conflict route. It is good to see the follow up line which assures the common readers about the reduction of fundamentalism. Quote, "the nascent democratic movements in Muslim countries will regress for a few decades as ruling autocrats use their participation in the global war against terrorism to terrorise their critics and dissenters"
I recall Indira Gandhi's emergency rule, where every petty officer in government abused the privilege given to him to run the organization effectively. They terrorized the people who worked under them. It was a nightmare. Quote, "Princes competed with one another to patronize scientists, philosophers and men of letters." The Muslims in America are working their way to volunteer their time and money to causes other than their own, wee need to accelerate that process and fully integrate in the society and be a part in contributing and participating towards the success of the society at large. We have to serve the needy, no matter who they are. Quote, "The family law in Morocco, known as Moudawana, was based on the traditional Islamic rules on marriage, divorce, inheritance, polygamy and child custody. …..A special commission, which notably included women, was created with the specific task of producing fresh legislation based on the principles of Islam." By using the word "traditional..." the author innocuously legitimizes that which was founded on mis-interpretations" as he beautifully segue into "producing fresh legislation based on the principles of Islam." I admire the principles laid out in the Morocco's new Sharia law, it incorporates a fundamental principle that most "men" jurists in the past ignored, overlooked or deliberately suppressed. The description of the day of accountability (Day of Judgment) is vivid – No one is responsible for the acts of others, it makes it clear that not even your prophet will come to rescue you; you stand alone with your good and bad Karma to take the next step. The prophet even told his daughter that, just because she is the daughter of the prophet, she is not going to get a free pass; she has to earn it – by doing good deeds. That is being good to God's creation; life and environment. It is about individual responsibility. The law, any law is written to bring justice to an individual and the society, and laws produced with the free and willing participation of all its consumers would be sustainable and more importantly, it will be "just". . Although the intent of Sharia Laws was justice, it has many flaws in its public application, we have them in Texas too, we have hung too many innocent people. Sharia must be subjected to critical thinking, those who were critical were ignored; they were not given a listen due to the political climate which the Author describes it well, it was a similar climate when those laws were formulated. Thank God for the net and face book, freedom will become the supreme value for human kind . By the way, the Moroccan Sharia laws are reflective of the laws we have in America, which are fair and carried forward with huge debates.